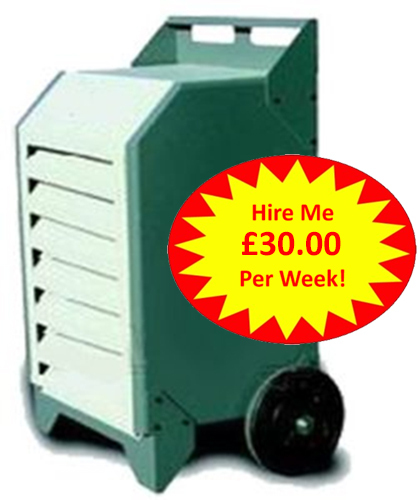 Hire Dehumidifiers - SCES Air Conditioning Ltd - The Home of Air Conditioning! Dehumidifiers – They operate in either moderately damp to extremely wet areas in need of moisture removal. Use them to improve storage conditions, maintain fresh locker rooms, safeguard stored goods from mildew, control the environment of computer rooms or to prevent water damage to building foundation and insulation and prevent dripping condensation from pipes. Likewise in the home they will prevent condensation, and keep stored items dry and mould free, and can be used to assist in the drying of paint and fresh plaster. Several dual voltage and hot gas defrost models are available from our extensive range. Heavy duty and more lightweight models are available with prices starting from just £30.00 per week plus delivery.
. Large Diameter Rubber Wheels. ..High Capacity, hot gas defrost For Low Temperature Operations.
. Power 840 Watts Maximum.
. Running Costs Approximately 12p per hr.
. Extraction Rate Approximately 38ltrs per 24hrs.